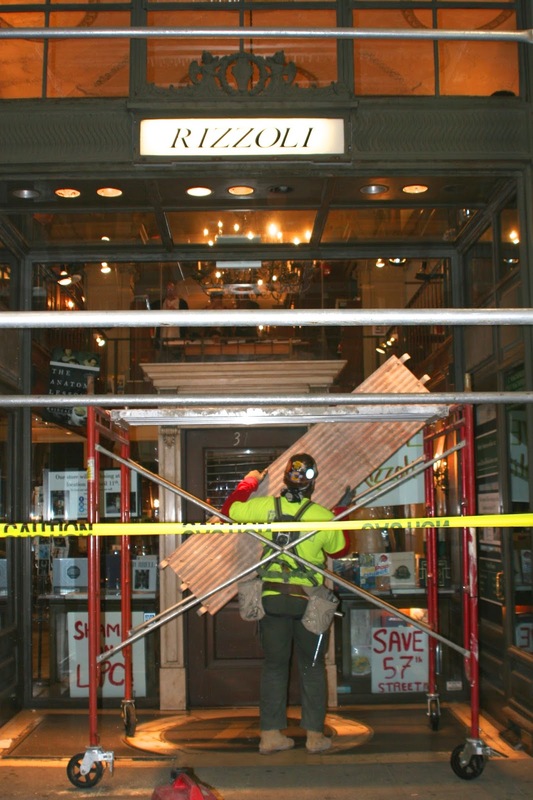 On Friday night, reader Robert Bischoff wrote in: "I made a last trip to Rizzoli's 57th Street Bookstore as they closed. A construction crew was waiting outside, and as the last customer left and the staff still inside, they began to erect a wooden storefront enclosure." 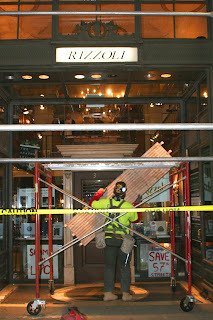 Protesters had spent the day outside the beloved shop, waving signs that said "Save 57th Street," "Save Rizzoli," and "Shame on LPC." 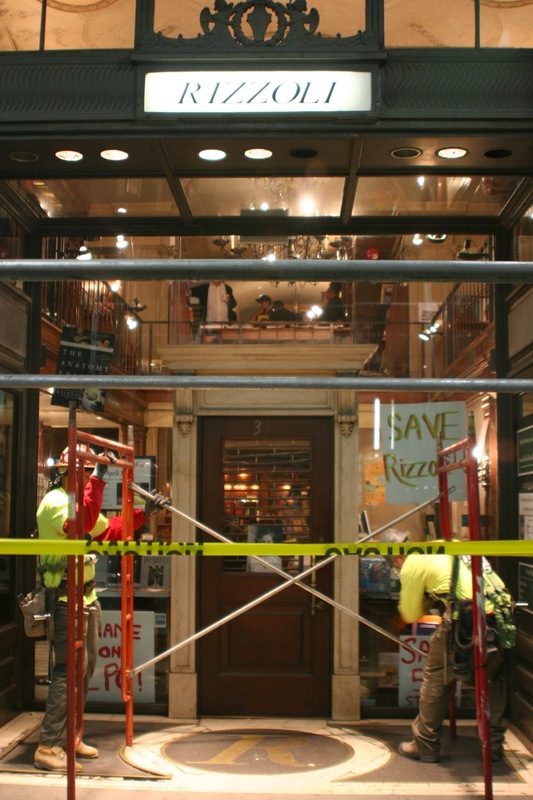 The Landmarks Preservation Committee had twice denied the bookstore and its historic building any protection from the coming demolition. In one photo, employees wave from the upper window, as if they're being sealed inside the soon-to-be tomb. 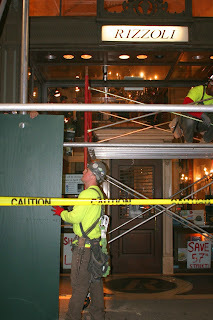 It does seem a little soon, unrolling the yellow caution tape and putting up the plywood before the corpse is even cold. What does the LPC stand for, at this point ? 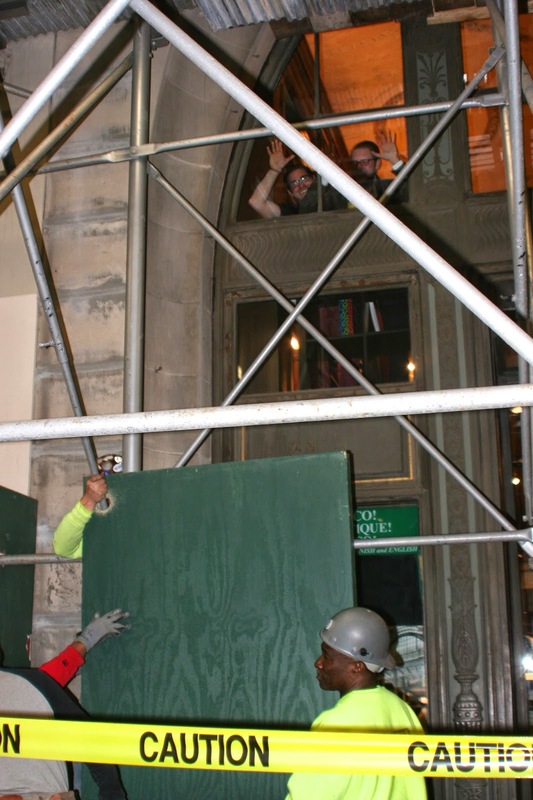 What is their mission, and how did this building not qualify for landmark status ? The LPC isn't actually preserving anything. Does anyone know or understand the process by which they determine what buildings get landmarked ? It's been said a million times but no one reads anymore, they just stare. Preliterate culture is here to stay... and much easier to control. A landmark is not just bricks and mortar. 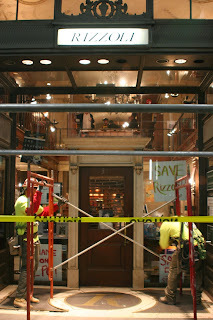 Rizzoli is a cultural landmark and should be preserved at all costs. Plus the interiors are stunningly beautiful. LPC is pathetic and grossly incompetent to sit by a let this happen. 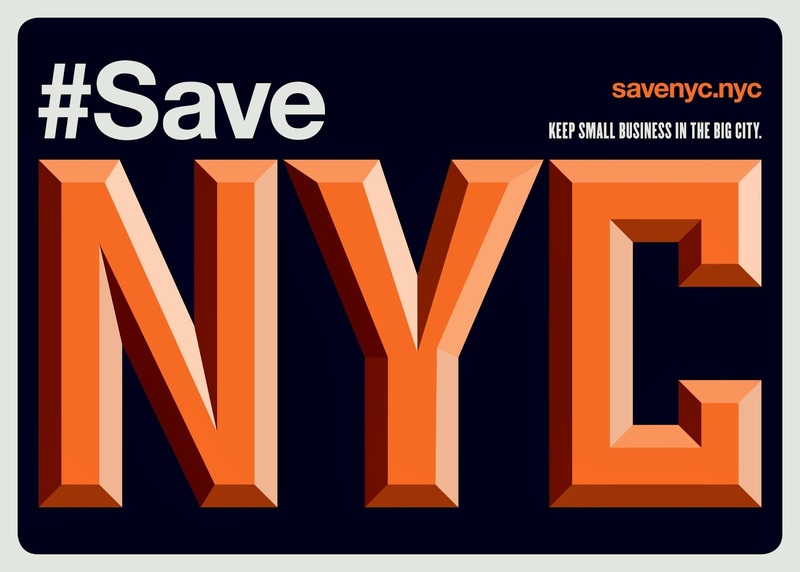 I am embarassed to have the NYC LPC represent this city. LPC was packed by Bloomberg with pro-development functionaries. Look at their performance over the past few years.